I recently adopted a poor crabbie named Macinaw Phil. He came from an older couple who "rescued" him from a retail shop in the UP. He came to me in one of those awful crab condos that are wire mesh. Needless to say, poor Phil passed away two days later. Turns out Phil was really Phyllis. My husband was traveling for work during all of this, and when he came home I told him the story and showed him the condo. He was SO ANGRY. Went off on how pet stores don't give people good info on care and setup. He wondered out loud what we could be doing to make it stop. I told him that I've been working on building good relationships with our local pet stores, and was hoping that with a little time, I could get them to see that updating their care info will improve their bottom line while giving these crabs a fighting chance. 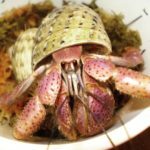 I also brought up the fact that all crabs sold in stores are wild-caught, and how the crabbers on this forum and elsewhere are beginning to successfully breed captive crabs. He was THRILLED with that, and then proceeded to ask if it could be possible for us to try. I said it was possible, but that I wasn't sure about adding a third tank to maintain. I have five PPs in my 150g crabitat. Tons of space. Can I put Es in there with them? The reason I ask is that Es have the shortened developmental stages so theoretically, they should be "easier" to get to land... If I MUST, I will add another 65g to my home for the Es by themselves. However, if they can go in with the PPs safely, it will be less work for me if we get to the point of kreisel tanks and all that that entails. I would appreciate any opinions on the mixing of species, in particular Es and PPs. I know Es have a tendency to dig up tank mates...does having 12" of substrate in a 150g make that less likely? Or should I just bite the bullet and set up a third permanent tank? Yes, you can add E's. I have 3 species in a 150. They're all doing fine. I had my Es breed once while I had them, as opposed to the PPs where a few females are gravid every summer. It took adding a large (jumbo) male who ended up being extremely aggressive and who killed several of the other Es in the tank. 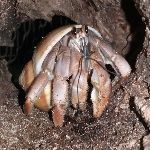 My preference is to keep species separate from that experience, but all crabs are individuals and will act differently. I have Es in with PPs. I have also had Es, PPs and Straws in together. I only decided to separate my straws from the Es when I added the toppers. This year I had PPs breed in one tank, and the Es bred several times in the other tank. I have never had any deaths with my Es, but it could be a personality thing? IDK - I do believe that Es should have at least 10-12" of substrate, and I do feed mine a minimum of two proteins a day and I give mine multiple calcium choices to choose from. Where have you heard that Es have shorter developmental stages? Twice now I have only made it to 14 days and they have passed away. They do have an abbreviated larval development, the same as Aussies. Off the top of my head I think it's 5 vs. 7 compared to PPs? wodesorel wrote: They do have an abbreviated larval development, the same as Aussies. Off the top of my head I think it's 5 vs. 7 compared to PPs? Thank you - I'll check that page out. I don't know the sexes of mine. I have seen that my larger Es are males - only because when they climb I look! I've found over the years that the largest crabs are exceedingly male. Out of 10 jumbos I've had, only 1 was female. Even the borderline jumbos skew like 7m to 1f. I don't have any input on the breeding portion, but I did want to say that I also keep my E with my PPs. They get along well, I hope in the future I can upgrade and get my E a species buddy. wodesorel wrote: I had my Es breed once while I had them, as opposed to the PPs where a few females are gravid every summer. It took adding a large (jumbo) male who ended up being extremely aggressive and who killed several of the other Es in the tank. My preference is to keep species separate from that experience, but all crabs are individuals and will act differently. PinchersAndShells wrote: I don't have any input on the breeding portion, but I did want to say that I also keep my E with my PPs. They get along well, I hope in the future I can upgrade and get my E a species buddy. Thank you for your input! I have some time to decide what to do, and I truly appreciate everyone's experience. It was an all E tank. There can be very aggressive individuals, or they can be sweet as pie. I've ended up with several aggressive ones that attacked tank mates, even when they were smaller.